KOHLER generators mean business for small businesses. Kohler invented the standby generator in 1920 and still manufacturers them in the US. Greenwich Power Systems is the leading generator dealer in Fairfield and Westchester counties. We sell, install, maintain and service all of the Kohler Power Systems Air-Cooled and Liquid-Cooled generators from the small 8kW through the powerful 150kW and beyond with all models in between. Whether you need LP, Natural Gas or Diesel to run your standby generator we will size the right one for your needs. Call us for a fully turnkey solution to your standby power needs. Lose power and your Kohler 8kW will standby you. 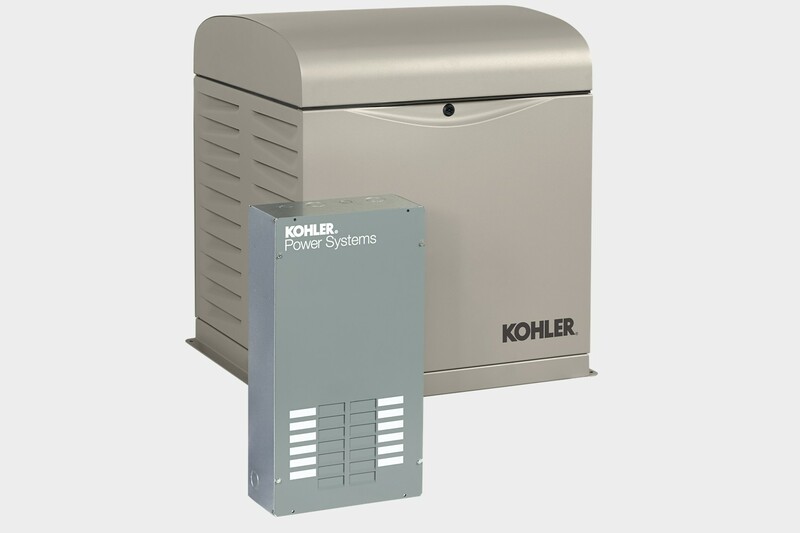 With one of the strongest motors on the market this little Kohler, with its OnCue monitoring system, might be all you need to keep your essentials up and running and while giving you the peace of mind that your generator will be there when needed. Small businesses sometimes only need small amounts of back up let this little guy give you all the power your business needs. Comes with RXT 100-amp indoor-rated automatic transfer switch with 12-space load center. Need a little more oomph for your business? The 12kW with is larger than average motor, advanced voltage and frequency regulation with excellent power quality for your electronics provides extraordinary reliability with its 5 years or 2,000 hour limited warranty. Also equipped with OnCue monitoring as a standard feature you’ll know your generator is ready for years to come. Keep your business humming right along with this Kohler 12kW. Every 12RESVL comes standard with OnCue® Plus, our remote monitoring system, which gives you peace of mind at home no matter where you are in the world. Reliable power that’s perfect for small business needs. When the power goes out during a severe storm or in the event of a power failure this generator keeps your business up and running! For Natural Gas or Propane, it’s hard not to like this system. It comes on in a flash, just 10 seconds, with high quality power, a quiet neighborhood friendly sound and the Kohler 5 year or 2,000-hour warranty. With its GM Vortec automotive grade power plant, hydraulic lifters and an operating speed of just 1800 RPM this is a definite consideration for the business site with a little more to power and preserve. For a small business that needs to power more, this generator with industrial-grade engine keeps your business’ computers, servers, and other critical electronics on. Go ahead, tell your customers you’re open and ready! For small businesses that leave nothing to chance, and nothing turned off. This industrial-grade engine turns on as soon as the power goes out. Could be one of the best business investments you make this year! Designed for Natural Gas this Kohler large standby workhorse is perfect to keep your business open and working. The Decision-Maker 3000 controller with patented software is compatible with optional accessories that let you monitor your system remotely through your PC. Standard features include a block heater for starting in cold weather and float type battery charger to keep your generator ready to start and run. Keep the lights on, the POS systems up and the business continuing whatever power problems nature or the power grid throw at you. A popular generator for the for a fair sized business. The industrial formatted design will keep your business in business powered without breaking a sweat. That goes for your customers and employees as well since this big capacity power plant will keep the AC running in Summer and the heat pumping when you need it. More than one successful business is being supported by this commercially designed power plant! Power the business essential and add on comfortable conditions for your employees. With over 500 AMPs of power using NG your options for keep things up and running and in business open. Yes, there are business standby generators but not many and this one will stand up almost any need in the normal commercial environment. Keep your business running, your customers happy until the power comes on again. With over 550 AMPs to power your needs this is the big player you may need when your business demands a little extra.